Today I have a little something to share with you, a project inspired by Laura Denison from The Paper Trail, I caught an episode of hers on You Tube on how to make these little beaded match books and was instantly inspired because they are so freakin' fast to make. I was in need of something quick and easy and so when I stumbled across this I knew it was perfect. I think it was last month sometime I shared a wedding book that I did for a very good friend of mine, well this is the companion to that; this is a mini honeymoon album with just enough room to add the most important details: a handful of photos and some journaling about where they went and what they did. So being that this is a travel album I wanted to find something to go along with the theme, just so happened that I had a *not-been-used-yet* travel theme paper pack along with the matching journaling spots ....SCORE!!! This is extremely rare for me when I work with my older papers because that was before I ever cared about stuff coordinating. But alas I have seen the light and try - at the very least - to match my project even if I'm using stuff from different collections. I assure you it is *challenging* at times! But as for this matchbook mini, I had a great collection to work with that had bright, bold colors that I knew my girlfriend would appreciate. Now if you're not familiar with the way Laura does this, the pages are actually pockets which I used to stash a tag photo pull-out; on the pages themselves I did one side as a decorative side and then the other side with a journaling spot to add the little details either about the photos or just something random that they don't want to forget. But what a great mini book it made! I love to travel and so therefore I typically like a lot of the travel papers. My current favorite is by October Afternoon called Boarding Pass and later on this summer I will be using it in an up coming mini so you'll have to be sure to check that out. 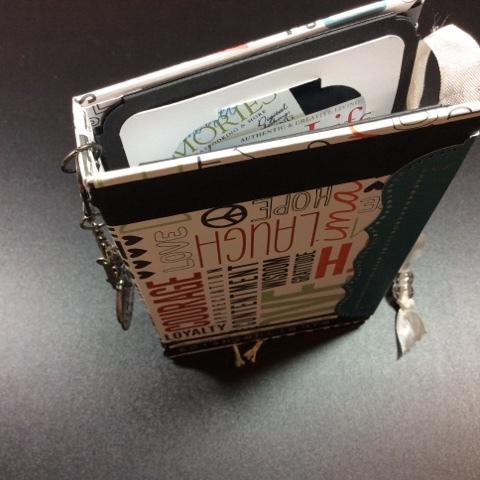 Well this is all I have to share today I hope you all like what I have done with Laura's match book album. I do have several more of these to share with you in the up coming weeks so I hope that you'll take a peek again soon. Later this weekend I will begin sharing my Week in the Life album that I participated in last week with Ali Edwards. Thanks so much & have a great weekend!